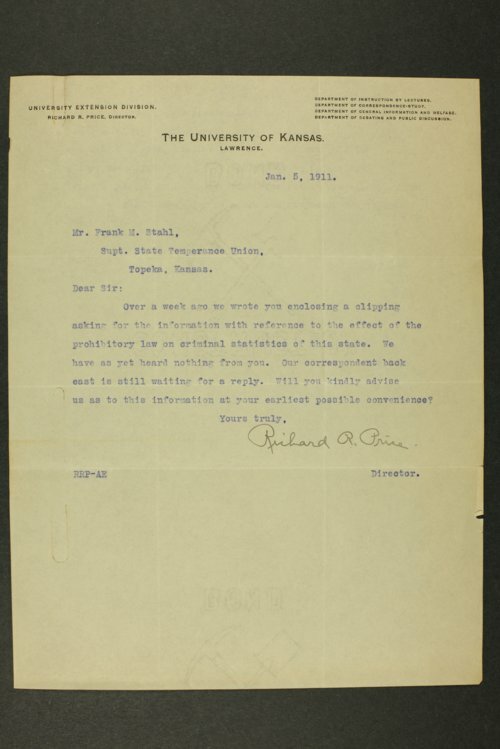 This correspondence was sent and received by Frank M. Stahl, superintendent of the Kansas State Temperance Union. A letter from James K. Shields, state superintendent for the Anti-Saloon League of Illinois, asks for Stahl's assistance in recruiting Governor Walter R. Stubbs for a temperance rally in Springfield, Illinois, in opposition to the "United Societies boozers of Chicago." A letter from J. F. Baker, legislative superintendent for the Wisconsin Anti-Saloon League seeks information about prohibitory zones around Kansas universities as the state of Wisconsin attempts to exclude saloons from the college town of Madison. Correspondence with W. H. Edmundson and E. D. Mikesell, attorneys in Fredonia, regards the selling and prosecution of "Belgian Beer" which supposedly contained one-half of one percent of alcohol and was sold by children at lemonade stands. Stahl responded that "the internal revenue collectors have rather overstepped their duties." Although Kansas was the first state to adopt a constitutional amendment prohibiting the sale of intoxicating liquors in 1880, the law was largely unenforced.